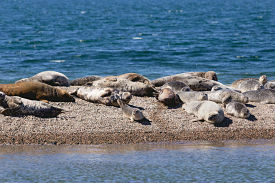 While Massachusetts boasts a wealth of interesting wildlife many on a Lloyd Center sponsored cruise were surprised to know that Buzzards Bay is home to seals. which, during the winter, is inhabited by fewer than 20 people. wintering seals, many of which perked up at the sight of the boat. Several curious seals bobbed about in the water, investigating the ship as is drifted toward the sandbar. Lazing is an important part of a seal’s routine, allowing it to rest and replenish its energy to be able to avoid and escape from predators. seals, the populations of which had plummeted in the 1970s when they were hunted, have increased dramatically since they were given protection under the Marine Mammal Protection Act. However, their increased number have also led them to attract predators like sharks. They can also be a nuisance to fishermen, who see seals as competition for fishing stock. Once on Cuttyhunk, attendees went birdwatching and shelling on the island. Home to summering families during the warmer months, the island was all but deserted for the winter. A large group trekked with Smith-Gillen and Lloyd Center Research Associate Jamie Bogart to Lookout Hill, Cuttyhunk’s highest point. According to Smith-Gillen, spending time outdoors provides a myriad of benefits. Not only to be people learn about their local ecosystem, but the exercise can improve brain activity and lower blood pressure. After departing, the ship pulled up once again to the sandbar, observing the seals from a different angle, this time managing to drift a bit closer to them.